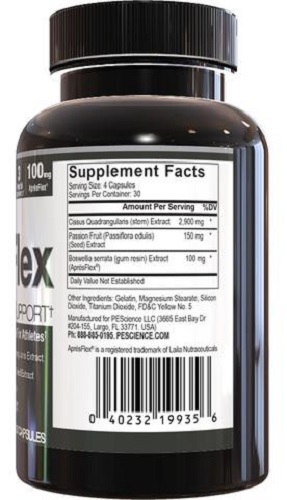 Formulated for Athletes: Cissus Quadrangularis Extract, Passion Fruit Seed Extract, 30-Day Supply, and ApresFlex. Take 4 capsules daily. For best results, take 2 capsules with each of your two largest meals each day. This product is intended to be consumed by healthy adults 18 years of age or older. It is designed for individuals interested in bodybuilding who generally do not have health problems. Preganant or nursing women should not use this product. Consult with a licensed physician before using this product, especially if you are taking any prescription, over the counter medication, dietary supplement product, or if you have any preexisting medical condition including but not limited to: high or low blood pressure, high or low cholesterol, cardiac arrhythmia, stroke, heart, liver, kidney or thyroid disease, seizure disorder, psychiatric disease, osteoporosis, diabetes, difficulty urinating due to prostate enlargement or if you are taking a MAO-B inhibitor or any other medication. Do not take this product if you have been diagnosed with prostate cancer, testicular cancer or breast cancer. Discontinue use 2 weeks prior to surgery. Discontinue use and immediately consult your health care professional if you experience any adverse reaction to this product. Do not exceed recommended serving. Do not use if safety seal is broken or missing. KEEP OUT OF REACH OF CHILDREN.